Friday, 26 March 2010. Gillnetting, a common fishing method, is killing endangered dolphins in India and Indonesia, experts at a two-day international conference on Irrawaddy dolphins here said. The Mahakam river, the third longest river in the world, located in East Kalimantan province in Indonesia is home to less than about a hundred Irrawaddy dolphins. The major threat they are facing in the Mahakam river was gillnetting, researcher Danielle Kreb said in a paper presented during the conference, which concluded Friday. The Mahakam river is 910 km in length and can measure up to 30 meters in depth. ‘The major threat involved direct mortality, which was largely caused by gillnet entanglement that is 74 percent of all deaths. Between 1995 and 2007, on the basis of interviews and our own observations, 51 deaths were documented,’ the paper said. ‘Dolphins were often observed feeding in close proximity to these nets. Many fishermen use the dolphins’ feeding patterns as indicators of the location and time to set gillnets thereby increasing the potential for entanglements,’ Kreb said in her research. She has been involved in the study and conservation efforts for Irrawaddy dolphins in the Mahakam river since 1997. ‘Dolphins were reported to aid fishermen by guiding fish into their nets. Fishermen reported that on several occasions they had successfully released dolphins from gillnets,’ she said. ‘Five dolphins caught in gillnets incidentally died and were eaten… the skin of two of them were used as medicine for skin allergies,’ Kreb said in her paper. ‘Pre- or neonatal mortality and deliberate kills each accounted for 8 percent of the documented deaths, the latter occurring mostly in isolated areas where the dolphins were rarely found,’ she said. Other factors that have degraded the dolphin habitat include sedimentation that is reducing the depth of lakes and decreasing fish resources, noise pollution because of high-frequency boat propellers and high decibel producing tugboats. Similarly, other factors that have degraded dolphin habitats were barges for coal transport, chemical pollution, mainly from coal and gold-cleaning waste, and prey depletion due to illegal and unsustainable fishing methods (electro-fishing, poison and trawl). Furthermore, over-fishing for non-sustainable aqua-culture practices (breeding of fish that feed on other fish) are also contributing to the degradation, she said. The Irrawaddy dolphins – adopted as a symbol of East Kalimantan – are protected in Indonesia and have been classified as ‘critically endangered’. Kreb suggests that the government should introduce night patrols to prevent illegal fishing practices in coordination with local fishermen. The Irrawaddy dolphin is listed as ‘vulnerable’ on the International Union for Conservation of Nature (IUCN) Red List of Threatened Species. Scientists and experts do not know exactly how many of them remain in the world. Biswajit Mohanty, a wildlife expert, said at least fifty percent of the dolphin mortality occurring in the Chilika Lake in Orissa is also due to gillnets. 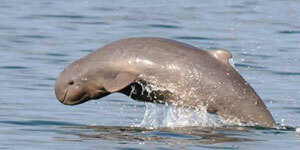 Chilika is home to about 158 endangered Irrawaddy dolphins. About fifty dolphins have died in the lake between 2003 and 2009 and about fifty percent of them were by gillnets,’ Mohanty said on the sidelines of the conference, citing government data.